Anthrax’s 11th album, “For All Kings”, has landed a top 10 debut on the US charts. Billboard reports the album debuts at No. 9 on the Billboard 200 with opening week sales of 34,000 units, nearly all in pure album sales. "We share this Top 10 victory with all of our fans," says drummer Charlie Benante. "Heavy metal is alive and well." “For All Kings” also debuted at No. 2 on Billboard's Top Rock Albums chart, No. 2 on the Independent Albums chart, No. 4 on the Physical Albums chart, and at No. 5 on the Vinyl Albums chart. Produced by Jay Ruston, the project marks the debut of former Shadows Fall lead guitarist Jon Donais, who replaced Rob Caggiano in the lineup following his 2013 departure. 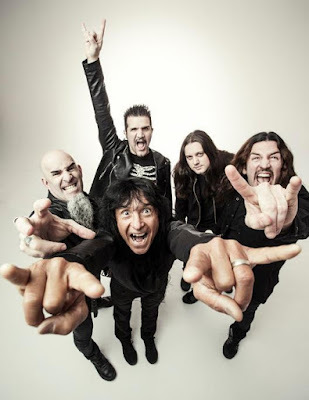 Anthrax are currently playing dates across South America with Iron Maiden.